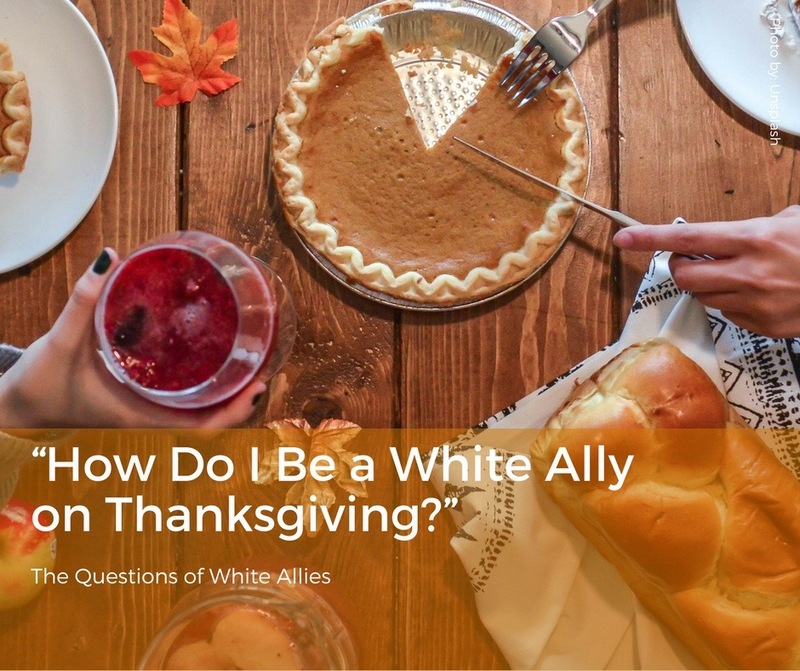 One of the spaces many white allies find difficult knowing how to navigate occurs on what is supposed to be one of the coziest and most heartwarming days of the year: Thanksgiving. As white allies deconstruct and continue to become less insulated by states of mind and experiences wrapped in cushioned bubbles of whiteness, we become more aware of both subtle comments of racism, as well as explicit expressions and statements that perpetuate racist ideologies that can often arise when we gather with family and friends. With growing recognition of social injustice, inequality, and white privilege, we observe the blatant displays of racism found in the testimonies of black colleagues, friends, the daily news, and when you spend the smallest ounce of unbiased energy to notice it. At times, these gatherings with extended family turn into places mixed with both relaxation and tension. We might be eating a slice of pumpkin pie while wondering, “When might the next explicit or implicit racist comment arise out of the lips of a beloved family member? What do I do if and when that happens? How do I respond?” To be honest, it has been enough for me that there have been moments of pure anxiety that result–racing heartbeats, shaky hands and voice, and a mind that won’t stop spinning. As local friend and writer of Justified Anger, Phil Haslanger, points out, “This year, if you are with family members who cross the political and cultural spectrum, you can expect that when folks sit down to watch the Vikings and the Lions play football before the meal, someone is going to make a comment about players kneeling for the National Anthem (insert explicitly or implicitly racist comment here). And then the debate will be off and running.” What happens when these comments and disagreements arise? There’s a tension felt in these moments between two different pulls. On the one hand, our sense for justice swells to the surface. We feel we HAVE to say something. We know that one of the primary ways for racism to be dismantled is for white people to confront the very systems and structures of which they primarily benefit, and this includes challenging racism that occurs in our very relationships. White people need to take avid responsibility in talking to white people. People of color have borne the burden of explaining over and over how racism is prevalent and experienced in this nation. That’s exhausting. I can’t imagine the burden to share again and again why I am legitimate. To explain day after day why I have worth to people who blatantly disagree and invalidate me. And to communicate this to people who give half-hearted nods and smiles while continuing to tear me down with the everyday actions they take to undercut me (regardless of whether they recognize it or not). And yet, this is the experience of people of color everyday. After listening to the words and experiences from people of color around me, who share their hopes that white people would speak up (as reiterated in part 1 of this series written by Justified Anger Director Harry Hawkins), and from hearts that become outraged at such promotion of seeing each and every human as anything other than distinct, beautiful, equal creations– we know we have to confront it. And yet at the same time, white allies look out and see that sometimes those making these comments or expressing racist ideologies and perspectives (even if they are unaware of what their statements imply) are their own flesh and blood . For many white allies, these are the people that raised us, loved us, sacrificed for us, worked to make sure we would be cared for. These are those who we’ve walked our lives with, and who have been there. And even if they are people who haven’t necessarily been the perfect, idealized versions of “family” that we would long for, we still are in a specific places and times, spending significant moments with these people. Do we really want to make things uncomfortable? Do we really want to ruin the mood? But what if they reject us? How do we love them still in the middle of all of this? What about not knowing what to say? What if they just keep fighting and aren’t willing to listen? We’re supposed to see them in a few weeks for Christmas . . . What if what we say now makes things weird heading into the next gathering? What does it mean to actually be effective here? Will being confrontational bring actual change, or will it just further alienate or reinforce their desire to dig their heels in? How do we share in a way that is convincing, or cause real change or progress, and not drive one further away? And while all these questions are asked, we are still confronted with this question: how does being patient and working with our family coincide with the reality that black bodies are being killed in the street, locked away in prisons, and discriminated against every day? Rebecca DeRose, Director of Student Engagement at North Park University in Chicago, shares a bit of her own experience wrestling through this herself. “It takes discernment to engage in difficult conversations with the people in your circle. As someone who works in education, I lean toward a developmental approach realizing people might be in different stages of their meaning making process. You may need to have the conversation in pieces. Also, none of us are creating ‘social justice converts’ in a day. Sometimes, we have to sit with others as they make sense of white fragility, shame, or guilt the same as how people helped us. People who disengage from this process will most likely keep operating from a framework that perpetuates oppressive systems. This is why I like the approach of patient persistence. The reality is, there is no “easy,” perfect way to confront racist remarks, ideologies, or implicit biases being purported this holiday season. If there were, I think racism would be solved and this wouldn’t be a question that is asked continually year after year. The reality is, the conversations are going to be hard, awkward, uncomfortable, and sometimes tense. You might walk away feeling bad for something you said, and realize your words were arrogant, a self-proclaimed “woke” verbal police who shoves your own thoughts and opinions down others throats, or shuts people down and assumes moral superiority because you think you are better or more experienced in social justice and being politically correct. This isn’t helpful, can further alienate, and can just simply be a rude. No one is asking you to be a jerk. They’re asking you to be effective. You may walk away feeling bad for not saying anything. You may walk away feeling like you had no idea what to say, despite how hard you tried. That’s the reality of the “patient persistence” of which DeRose writes about. The question is, how do you keep these two realities in tension? The tension that there is no room for racist ideologies, comments, and perspectives to be affirmed, nor to be given the impression of affirmation through silence. That racism in all its forms must be fought with veracious ferocity. And at the same time, the tension that as a white ally, you are to find ways to actually and genuinely change the system. This does not occur through utter dismissal of family and friends who disagree with you, or a self-righteous attempt at “wokeness” of which you share your sanctimonious views as better than your bigoted and clearly “not as smart as you” family member. As Justified Anger volunteer and history class participant Don Thornton shares, “Trying to upstage ol’ Uncle Joe only plays into his hands, and makes everyone else extremely uncomfortable.” And the reality is, the views purported are likely the same views you would have perpetuated had you not had the grace to be given sight to the inequality and injustice that remains blind to many whites due to their place of privilege. Additionally, some of the comments that reek of racist undertones the most come as statements that the speaker don’t even recognize as racist. This doesn’t mean we don’t confront it or deconstruct it, but immediately saying “that’s racist” will typically put others on a defensive posture, and actually shields you from doing the hard work of walking with someone else through the implications and problematic nature of what has been said. Even as I sit here and write, I tremble thinking of my family reading this thinking I’m condemning them or assuming I’m taking a self-righteous stance. To the contrary, I’m excited about the progress I’ve seen in both myself and my family as we all have grown together in this journey of consciousness towards the realities of racism and the need to confront it. Note what I said there. TOGETHER. We’ve all had our own specific growing experiences and stories that have pushed us to grow in our understanding of how racism is still alive and well today–both systemically, as well as implicitly in our own perspectives. I’ve been inspired to see the zeal rising up in family members who choose to educate themselves on racism, who engage with the topics regularly and choose to discuss and probe these issues in the classroom, who express their desire in their heart that they feel called to racial righteousness, and who stand up on Sunday mornings to affirm and acknowledge black women who have been treated disrespectfully. And what’s funny is, this has mostly happened in organic ways. Not when myself or one of my family members confronts or acts self righteous, though sometimes hard conversations are needed. Instead, it is because we come to see and know these truths for ourselves. I know not all families have this privilege of mine, in which we’re able to grow together. I know many feel like isolated and lonely souls in houses where they feel judged, attacked, and rejected for even speaking a hint of confrontation against racism. But I hope you know that there’s hope. Each and every one of us have grown in this, through our own pains, failures, and struggles. It’s a process. No matter how hard white allies may try in their process of recognizing and owning privilege, we never shed our white identities and lenses of privilege we have been given. We can only become more aware and grow to have fresher eyes and stronger urgency to fight. My family will never be perfect, and neither will yours. Personally, I will always need to have these conversations to check and evaluate my own stuff. I can’t escape it. That is the case with all white people and white allies. My family included. And for that reason, this will always be my Thanksgiving experience. This is part of what it means to be a white ally. I think these are questions we all continually ask, and must continue to do as white allies. How do we confront racism? There’s no easy answers. There’s only tension to navigate. But this is the task of us as white allies. Let’s get to work. This article was authored and edited by Justified Anger’s Communications Coordinator Tyler Nylen, with contributions from the following: Phil Haslanger (Justified Anger writer and retired UCC minister), Don Thornton (Justified Anger volunteer and history class participant), and Rebecca DeRose (Director of Student Activities at North Park University in Chicago, IL).